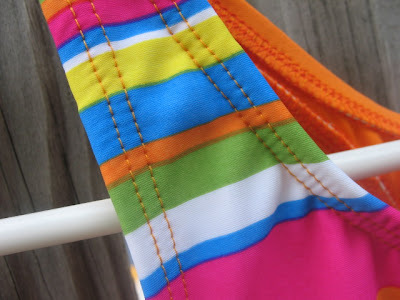 Last year I posted quite a lengthy list of tips for sewing swimsuits and then added a couple more after some of you had questions. Our cousin Tiffany, after reading the post, wanted to know why I wasn't using my serger to make suits when I had one. My response, "I have no idea." And really, I don't know why I wasn't using it because I LOVE my serger! I've had it as long as I've been sewing swimsuits. And anytime it needs some work done I am immediately calling my sewing machine guy to fix is ASAP. So..., since then I have been playing around with sewing suits with my serger. And I have to say that I love the finished look so much better. I've even used the serger to attach the elastic directly to the suit. 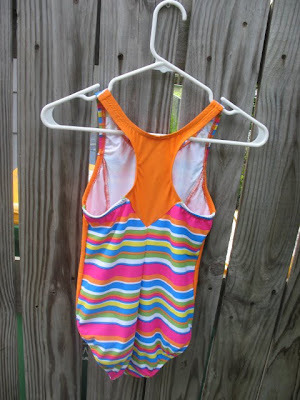 You can certainly make swimsuits without a serger (I did it for YEARS), but if you have one--use it! It may take a little practice or getting used to but I find that the suits go together much more quickly using a serger. And it looks more professionally made. I have switched to using 3/8" swimsuit elastic on everything except little baby suits. I haven't ever had problems with regular elastic breaking down from the chlorine, but I do think I like it better as far as the stretch and comfort. Also, once again remember that you need only stretch the elastic the LEAST amount possible to fit into the piece. DON'T overstretch or it will not lay the way you want. Here's the latest one I just made for my middle daughter. Shouldn't lose her when we're at the pool. Fully lined except for the back inset orange piece. I've also adjusted how I topstitch my swimsuits. I use a STRETCH twin needle exclusively now. (and make sure it is a STRETCH twin.) It makes for a more professional looking finish. This is what a TWIN (or double) needle topstitch looks like on the swimsuit. For the majority of suits I use a size 4,0/75 Stretch Twin. At times I use a 2,5/75 on baby swimwear (if I am using 1/4" elastic). Most machines are made so that you can use a twin needle. Check your manual to be sure, but if there are 2 thread loops where your needle inserts into your machine for sure it is made to handle twin topstitching. We're gearing up to enjoy the summer and the pool. 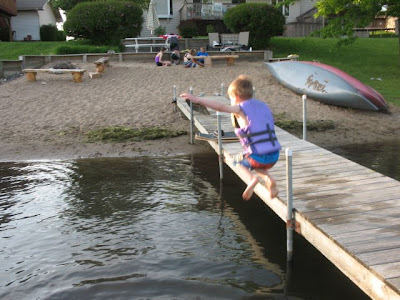 We had our first test run the other day at our friends' house on the lake. Bring it on! Hope you all have a great summer too! You can always check to see what's available at my shop too! Wow! The serging makes it look even nicer! BTW--My machine only has one thread loop and I still use a double needle. It hasn't ever been a problem for me. Thank you for sharing so freely about your swimsuit sewing experiences. 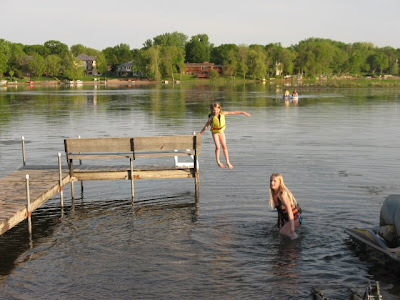 I plan to make a swimsuit (or 3 or 4) for my tall, slim daughter this summer, and you are one of my inspirations. I'll be doing it without a serger. What kind of thread are you using with the serger? I just regular cone thread--nothing fancy about it--Maxi-Lock or Gutermann 100% polyester. I am sewing my swimsuit for the first time and I do not have a serger. 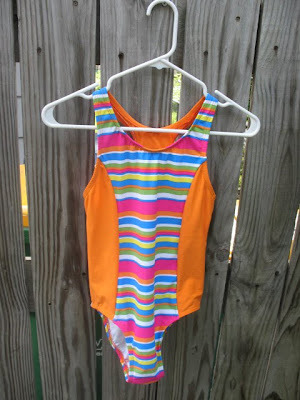 I was wondering, before you started using your serger on swimsuits, did you zigzag stitch the elastic and then use a double top stitch on the front of the swimsuit? Good for you for making a swimsuit. They really aren't as difficult as everyone thinks. So to answer your question....Yes, go ahead and use a basic zigzag to attach your elastic to the suit. Just make sure the zigzag is large--not too small or too tight--so that you don't inadvertently cause it to remain stretched out. Then once you have the elastic attached use the double needle to topstitch. Same thing--don't stretch it out too much--just enough to lay flat while sewing so that it you don't cause it to stretch too much and then not lay flat. If you need to--take a 6" piece and do a practice run with your zigzag and topstitch to make sure the settings are what you want. Good luck. Feel free to email us directly if you have any more questions. It may make it easier to correspond bakc and forth. Where did you find the stretch twin needle? There is only one store here locally where I can buy them--not at a Jo-Ann's unfortunately. Not sure why more stores don't carry them. You will probably have to order them online. You can try the Schmetz website directly or just do a search for them and see where you can get them. I think a place called Sew Sassy carries them online too. I have a cover stitch machine that uses universal needles ONLY. I haven't had any problems with them on knits, do you think this would work for top stitching? My regular machine and the twin needles I hate to use.